Why is Everyone Interested in Wheat Breeding? As I have noted before on this site, this summer has been very interesting in terms of the changing landscape in wheat research and breeding. Monsanto, Bayer, and Syngenta are all engaged in the wheat breeding game. I have received, many emails from readers, asking the same question. This is a great question. One can only speculate at this point but from a genetics standpoint it does really provide some interesting potential outcomes. Higher yields and lower environmental impacts are the most discussed by breeders and stakeholders. The other side of this discussion is the questions around saved seed and the possibilities of technology use agreements. In my mind if the product has benefits to the farmer, the farmer will pay for the technology. If there is no advantage then the farmer will not pay. This is simple economics and applicable in any market segment and not just agriculture. I think that it is silly for people to suggest that farmers are forced to buy hybrid seed. In my experience, farmers that have the right land and environmental conditions, demand hybrid seed. If you don’t have the proper land or conditions use choose other options. The following video was produced by Monsanto but shows why wheat is such an important crop to farmers and seed companies. The reality is that the future really is wide open for global wheat production. With large biotech companies now engaged the next ten years will prove to be interesting at the very least. On top of this is the huge contribution that conventional breeders will provide. Wheat is the global staple crop. There is a wheat harvest happening every month of the year somewhere in the world. The following video with Jay Bradshaw, President of Syngenta Canada discusses why biotech wheat will have benefits and why the variety registration system is too slow to enable innovation. It was filmed in February 2009. Please let me know what you think about the future of wheat. What kind of improvements would you like to see in wheat vareties? With this weeks announcement that Monsanto is buying Westbred LLC it is very clear that the biotech industry will have a say in the future direction of the wheat breeding business. As I have mentioned on this site before, pull type traits like drought and nitrogen use efficiency will be big components of the Monsanto breeding program in all crop types and not just wheat. With the recent push for biotech wheat by the biotech wheat coalition and this announcement, you can ultimately expect all of the biotech industry to heavily invest in wheat breeding over the next twenty years. With Syngenta, Dow Agro, and Monsanto all involved in wheat breeding the objective will be increased value creation for the whole value chain. After attending the CSTA summer meeting this past week in Whistler, it is quite clear that the industry must invest more in wheat breeding if we are going to see some of the benefits found in other crop types. Based on the fact biotech wheat is not accepted globally it will be interesting to see what moves these breeding programs make in the meantime in the conventional plant breeding areas. One thing is for sure the world of wheat genetics is getting very interesting and this story is not quite over yet. More to come definitely. This afternoon I talked to Richard Phillips, Executive Director of the Grain Growers of Canada about the possible introduction of biotech wheat to the agricultural system. The Grain Growers of Canada were members of the Biotech Wheat Coalition that is trying to push the international community to support biotech wheat. Shaun: Why is the Grain Growers of Canada supporting the idea of biotech wheat? Phillips: A major reason is the concern that we have over the slow rate of research development in conventional wheat vareties. If you look at the other crop types that have biotech traits, they are developing nutritional, agronomic and yield benefits. If wheat stays conventional the result could be that wheat becomes a rotation filler in between cash crops for most wheat farmers. Shaun: What are the possible resulting benefits of biotech wheat? Phillips: We need to send a strong message to public breeding institutions, Syngenta, and small biotech firms to bring new innovations forward to the market. These innovations could include nitrogen efficiency, heat tolerance, fusarium resistance, or cold tolerance. Non-agronomic benefits are in improvements to the milling process and further benefits to the consumer. Consumer benefits include things like health traits. I would like to thank Richard Phillips of the Grain Growers of Canada for his time and comments. Find out more about the Grain Growers of Canada. As RealAgriculture.com has discussed before the need for biotech wheat is rising and the usual roadblocks are presenting themselves as discussed by the Canadian Wheat Board in a Reuters Story on May 15th. Must be assurances that the GM wheat could be segregated from the non-GM wheat. 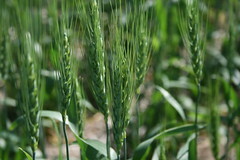 Biotech is the avenue for pull type traits to become a reality in wheat. I take issue with Mr. Klassen’s comments in the Reuters piece as he explains that producers have made production adjustments on their farm production practices and conventional breeding has proven to provide some of the same benefits to farmers as biotech wheat would. How does this apply to things like fusarium prevention, improved food taste, nitrogen use efficiency and drought tolerance? In reaction to the wheat boards usual joust that we have no way of segregating the conventional varieties and biotech varieties, I say that maybe we should start building a grain handling system that promotes new markets and identity preserved variety systems instead of forcing farmers to produce a homogeneous product against lower cost rivals in South America. Somehow in Canada farmers produce non-GM and GM canola and accomplish segregation. Why could this not work in wheat as well? Please remember that trait development is no longer just about production traits but pull type traits that will directly benefit consumers, which in my opinion will lead to the global acceptance of GMO’s. As stated in the Canadian Press Release—The application of biotechnology in wheat research could lead to the development of several traits to improve wheat yields and wheat quality. Traits to improve yields could include those that deal with environmental factors (e.g. drought, cold tolerance), combat weed or insect infestations (e.g. midge, sawfly), improve disease resistance (e.g. fusarium, rust) or improve the wheat plant’s utilization of nutrients. Traits to improve the quality attributes of wheat could include those that are designed to accommodate consumers with food allergies, reduce obesity, or improve the nutritional profile of wheat-based foods. If anything, it is at least time that we reinvigorate the discussion around biotech wheat and not fall into the same roadblocks and instead begin working towards solutions for those roadblocks. Lets talk to our overseas buyers and discuss the benefits biotech wheat could provide. For example, ask 10 bakers if they would like a grain that would extend the life of a loaf of bread by 2 days. What would the net impact be on a hog farm that could buy fusarium free wheat to feed to their hogs. Or maybe ask a pasta maker, would he like a durum that would produce ultra low cadmium levels or improve the production process by a significant amount. One thing proven this past week is that this nonsense that farmers do not accept GM crops but instead they are pushed on them by large multi nationals is ridiculous based on the resounding collective voice heard throughout the world by wheat growers in forming this biotech wheat coalition. 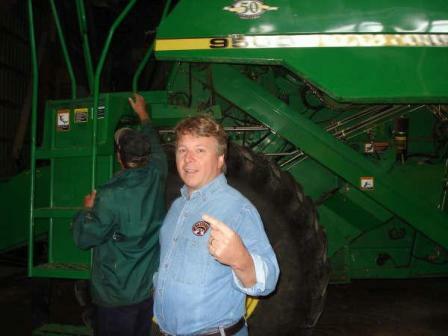 Traditionally farmers have always thought of planting their crop in terms of bushels per acre. Bushels have been a unit of measure that we have felt comfortable with in the past because it was a function of pounds. For example, one bushel of barley is 48 pounds and if you seed two bushels per acre, you are seeding at 96 pounds. This was the simple convenient way because it usually was the same number every year. 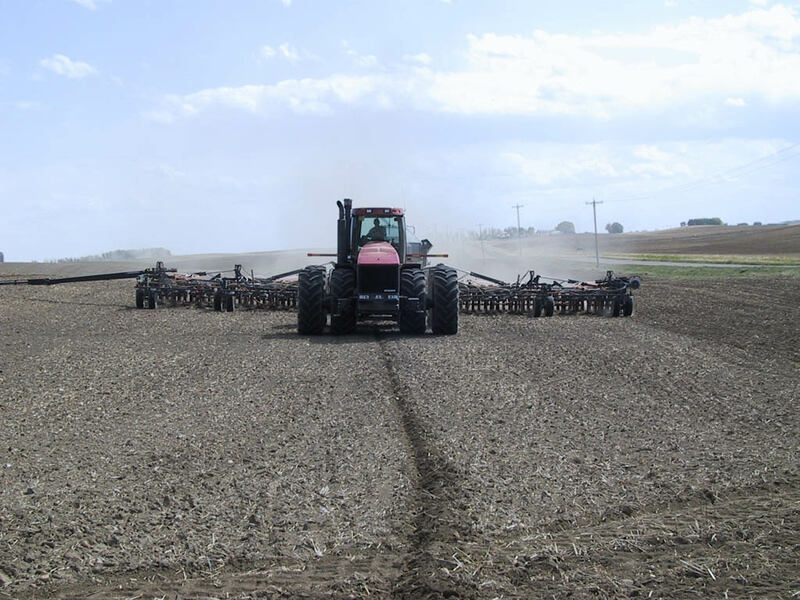 When you seed at the same rate every year you are not taking into consideration many of the important variables that can have dramatic affects on your yield and your bottom line. There are some drawbacks to this traditional system, which has spawned more agronomical based calculations for planting rates. Does not consider the actual weight of the seed (1000 kernel weight). This is important because for example, not all barley weighs the same. Therefore you may think that you are planting 150 pounds per acre but are truly planting 125. The calculation that is recommended by researchers is to obtain a desired plant population based on plants per square foot. This calculation takes into account the germination of the seed as well as the 1000 kernel weight and the row spacing of the drill. The following example will outline this concept more clearly. Seeding rate (lb/ac) = desired plant population/ft² x 1,000 kernel wt (grams) ÷ (germination – mortality) ÷ 10. At http://www.ropintheweb.ca/, click on the calculator tab and find the seeding rates section. In here you can enter your seed information to calculate the seeding rate that is best for you according to the variables discussed in this article. Farming in the 21st century requires accurate scientific based decisions because of lack of room for error due to decreasing margins. In this segment of our Canola School, Matt Stanford of the Canola Council of Canada discusses how you should be caring for the canola seed you purchased. Matt talks about why you should keep a seed sample and a blue tag from every lot of seed to help you if issues arise. I tell customers that they should think of the blue tag as a receipt of quality. Matt also discusses the need to be careful when loading your drill with canola seed and to be sure the seeder wind speed is set properly. There has been a lot of confusion amongst some people regarding Monsanto‘s application for GM drought tolerant corn for feed and food use in Canada and the United States. The application has been made and could be ready if approved fro commercialization in 2012 or 2013. This gene will provide farmers with the ability to stabilize yield during adverse rainfall conditions. In my mind this is the kind of 2nd generation trait development that is going to provide excellent production benefits to farmers and have added benefits to the general public. According to Trish Jordan, Public Relation Lead at Monsanto Canada in Winnipeg, agriculture accounts for 70% of the worlds annual water usage. Traits that allow plants like corn to use less of it will have a positive impact on the environment. Lately on Twitter, there has been a lot of public criticism of Monsanto “pushing” this technology on the public. A couple weeks ago I spoke to some University of Lethbridge Agriculture students about the second generation of trait development which will provide not only production benefits but also greater benefits for the general public. I call this pull type trait development instead of push type trait development. Ask any city dwelling friend who knows nothing about agriculture whether or not they think we should develop plants that use less water but remain just as productive. I would imagine that they would think that it was a great idea. Pull type GMOs will become more acceptable for the general public because they provide benefits to all of society. Push type GMOs really only provide direct benefits for farmers because they were strictly production based and do not affect city people. Monsanto is not “pushing” the drought tolerant gene on anyone. This is a gene that farmers and people concerned about the environment will benefit from. Sounds like a positive innovation to me. You are currently browsing the archives for the seed category.